This is the sequel to Dreamwalker and I enjoyed reading this one more than I did the first one, hence the four trees this time. What I liked most about this story is that it was a little more action packed and, although it still felt like it dragged in some moments, it was still more fast paced -which I liked. Blame it on my ADHD, but when books start to go on and on about the same thing, I easily get bored and lose complete interest in wanting to find out what else is coming next in the story. Yet, C.S. Friedman, despite sometimes going round and round on certain topics, always kept me wanting to find out more of what was happening. 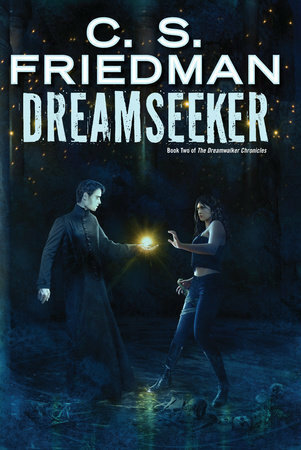 In the second installment of the Dreamwalker series, Jesse starts to realize from early on that her powers -or, as is called in the world where she is from, her gift -are developing. It started with seeing that someone was invading her dreams, which showed to be dangerous because then there were creatures attacking her and, when she would wake up, she had the physical signs of said attacks. Eventually she is able to control her gift better and is able to go into other people's dreams, which proved to be useful, for she was able to find out information she needed to help succeed in her plan through this method. The one thing that really shocked me as much as it did Jesse was to find out the horrible truth about someone she trusted. It was very shocking because we all thought this person to be faithful and on her side. Yet, the one you least expect to actually be on her side, was. This is one of the reasons I liked this installment better and made me want to find out even more of what's to happen to Jesse. Will she be returning to this alien world yet again? Will she be able to accomplish everything she wanted to accomplish in this book? Like that, I have many other questions, which is why I will be reading the next book when it comes out for sure.